This budget has been focused on developing the rural landscape. Increased allocation for rural spending is seen, with more stress on the agrarian families livelihood. In the year 2018-19, for creation of livelihood and infrastructure in rural areas, total amount to be spent by the Ministries will be 14.34 lakh crore, including extra-budgetary and non-budgetary resources of `11.98 lakh crore. These are big numbers, but magically they will come together. The expenditure will create employment of 321 crore person days, 3.17 lakh kilometers of rural roads, 51 lakh new rural houses, 1.88 crore toilets, and provide 1.75 crore new household electric connections. Below have been the major highlights of agricultural and rural spend by the government. Government Is Obsessed With Subsidies. India’s obsession with subsidies never dies down. The subsidies take a center stage in most of the budgets irrespective of the government. Today’s budget was no different. Subsidies accounted for 11% of the total budget size of Rs 24.42 lakh crore. The center increased subsidies by 10.87% from the 2017-18 RE to current 2018-19 BE. 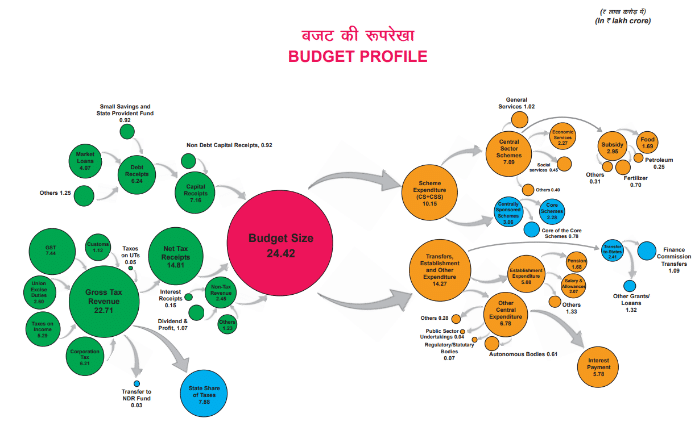 The current budgetary estimate stands at Rs 2,92,824 Crs. 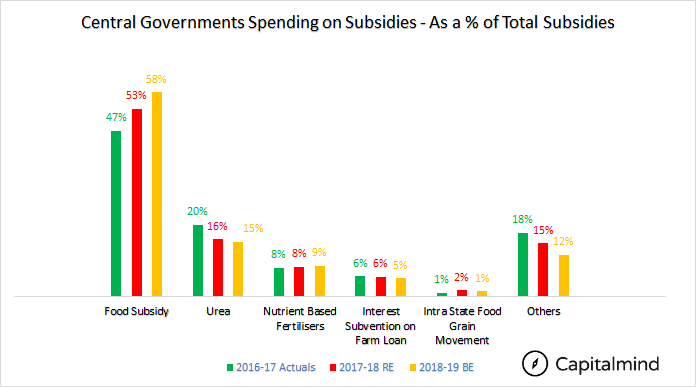 And if we analyse properly food subsidy accounts for 58% of the total subsidies and fertilizer (Urea + NPK) accounts for 23.93% of the total subsidies. Food subsidy accounts for nearly 6.9% of governments spend and Fertiliser subsidy accounts for nearly 3% of the total government expenditure. Together they account for nearly 10% of total budgetary spend by government. Farmers to Get Minimum Support Price of 1.5 x of production cost. To increase the spending capacity of a farmers, government has increased the minimum support prices for the crops by 1.5 times of production cost. Most of the budgetary allocation for this segment are met from the food subsidies that government undertake to buy rural produce. These trends have been most common in Uttar Pradesh, which is a major sugarcane growers. During the election period, the state government used to raise the minimum support price of sugarcane, even the market dynamics worked on demand and supply. This in turn meant losses for the sugar mills, which had to take sugarcane at higher prices and were unable to sell sugar at proportionate price. In the budget Government further went ahead and said, if the market prices are below the MSP, then the government will try to buy the produce at MSP. In case it is unable to do it, it might ask state governments or some other agencies. Market dynamics works on demand and supply. Its only possible if the government is the major buyer of the produce – and in the case of rice and wheat, the govt IS the major buyer, and we buy produce and let much of it rot. The extra spending here means that regardless of whether we over-produce or even need the food item, the government will just keep buying. So there is no focus on efficient farming – if too many farmers produce onions, the price crashes and then too many farmers don’t grow onions. If the government buys regardless of how much onion is needed, then farmers keep producing onions and we as a country keep buying them. This won’t hurt now, but it is a bad policy for later. Agricultural Credit Target Increased to Rs 11,00,000 Cr. The government increased the credit target for agriculture from Rs 10,00,000 lakh crore in FY18 to Rs 11,00,000 Crore in FY19. The impact of this is far reaching, as 86% of farmers are small and marginal. The interest subvention is costing government nearly Rs 15,000 Crs. (The government pays part or all of the interest on many such loans) On a broader scale, this will increase the investments in agricultural activities by farmers and in turn can boost the rural economy. The problem: Most of the small farmers are working as contract farmers and they dont have the rights of the land. This prevents them from getting cheaper loans. And again they will be looking at secondary markets with higher interest rates for loans. It would have been much better if the government could have come up with guidelines for credit structure for contract farmers. Rural Housing Budgetary Allocation Increases. Pradhan Mantri Awas Yojana Rural gets an budgetary allocation of Rs 21,000 cr and extra budgetary allocation of Rs 12,000 Cr. They will be building nearly 49 lakh houses in this scheme and generating roughly 46.55 Cr Man days of employment. Apart from this the previous announcement by Prime Minister regarding interest subsidy of 4% for housing loans taken under PMGAY. Loans up to Rs 9 lakh will have interest subvention of 4% and 3% up to Rs 12 lakh. Fasal Bhima Yojana have been another step forward towards securing the agricultural produce for the farmers. Under this scheme, the government has outlayed a spending of Rs 13,000 cr (An increase of 21.52% from 2017-18 RE). This scheme will be covering around 98 million hectares of Gross Crop Area. The coverage for crops will be around 50% in FY19 (40% in FY18). The sum insured under this Yojana has more than doubled from 69,000 crores in Kharif 2015 to Rs 1,41,625 crores in Kharif 2016. Meaning an inflow Rs 1,41,625 Cr in rural economy – and this is a truckload of money! 22,000 rural villages have been identified for developing them into agricultural market places. These will be electronicaly linked to e-NAM (e-marketplace) and will provide direct connectivity to customers. These GrAMs will be not under the ambit of APMCs. Rs 2,000 Cr has been set aside for developing these 22,000 Cr GrAMs. Basically this will bypass APMCs but introduce a new set of middlemen. While the GrAMs and e-NAM are the best way to connect the producer and consumer, still its more of a fiction then reality. Their have been lot of problem areas in developing e-NAM which can subdue the current “Mandi” system. Agricultural producer doesnt know how to use the system and lack of transparency (quality of the product, transportation charges, taxes involved) drives away the user. To make it a better initiative, first the user has to be educated about the system in place and the procedure for quality testing and storage and transport has to be streamlined. MGNREGA budgetary allocation has been increased from Rs 48,000 Cr (2017-18 RE) to Rs 55,000 Cr. This has been the highest ever allocation. Green revolution, White Revolution and Blue Revolution get allocated Rs 13,909 Cr, Rs 2,220 Cr and Rs 643 Cr respectively. An increase of 24.35%, 35.94% and 113% from 2017-18 RE. Prime Minister Saubhagya Yojana to provide free electricity for rural household comes in at allocation of Rs 16,000 Crs. Pradhan Mantri Kisan Sampada Yojana i.e agro processing and storage gets Rs 1,313 Crs. This is a huge push to the rural economy. No one knows how it will be funded. There’s still expansion of road infra, and rail infra that need funding. Now the big rural push. The benefits will take years to accrue. And much of the benefit will probably need to weed out corruption and middle layers from the process. However, the rural push simply means there’s more for the farming community, and for rural roads/infra. The spend numbers are so high that it’s not possible to easily quantify how this will work out, but let’s wait and see how projects are done, especially the MSP increases.